One of the recurring themes in our review of vintage catalogs is the inevitable changes wrought by the passage of time. 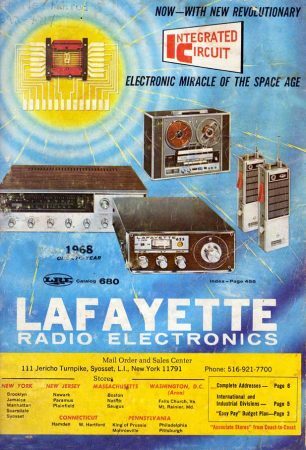 One era’s common knowledge is another era’s “Hunh?” If you’re under 30, what could you tell me about today’s headline, or the gadget pictured on the back cover of this 1968 Lafayette Radio Electronics catalog? 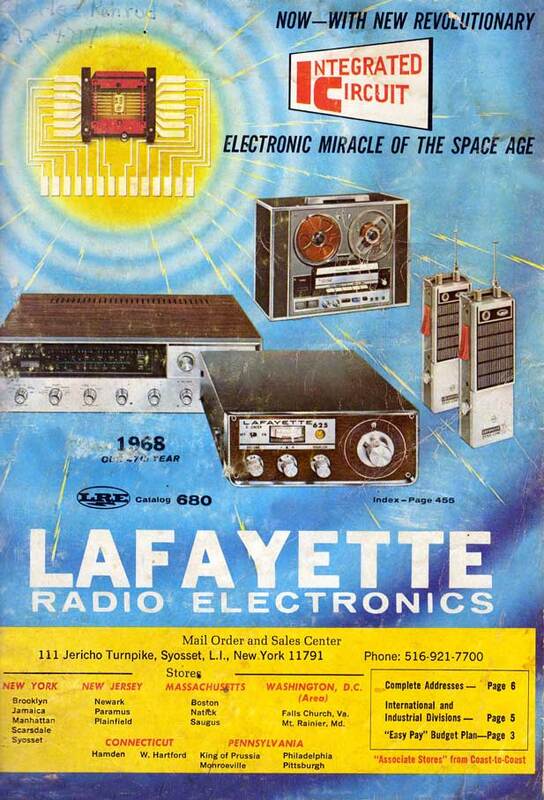 For that matter, what could you tell me about Lafayette Electronics (without resorting to Wikipedia)? 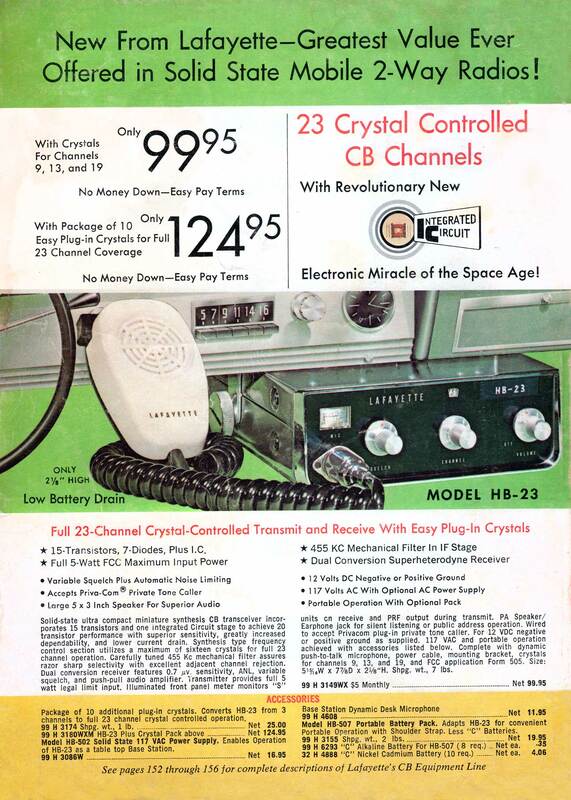 The device is a Citizens Band receiver, popularly known as a “CB”, and was for a time nearly as popular a car accessory as 8-track tape players. Now we would use our iPhones, wirelessly linked through Bluetooth to our vehicle’s “infotainment” system, but in the 1960s and especially the 1970s, you would use CB radios to chat with other drivers about…well, usually about whatever speed-checking cops (“Smokeys”) lay further down the highway. It was unbearably primitive and limited, and yet it was captivating, the possiblity of sharing information with strangers from your car. CB inspired it’s own slang (“Breaker-Breaker One-Nine”); books; popular movies like “Smokey and the Bandit” – even a 1975 #1 hit song called “Convoy.” Note that the CB radio is pictured underneath the car’s AM-only radio and analog clock, also long gone from autos. As for Lafayette? They were for many decades the most serious competitor to Radio Shack. Both were formed in the early 1920s during the original radio craze, both expanded into large catalogs and nationwide store chains. But Lafayette couldn’t match Radio Shack’s expansion pace, and experienced financial difficulties due in large part to — Citizen’s Band radio. CB sets were originally limited to 23 channels (the user had to pick an empty channel on which to hold a conversation) but in 1977 the FCC expanded the band to 40 channels. Lafayette was over-invested in 23-channel sets, which suddenly had very little value: this plus other factors force Lafayette into bankruptcy in 1981. Lafayette was bought by Circuit City. Hey, what happened to Circuit City? What happened to Radio Shack? What happened to CB? Actually, that last one is still around — just not very popular, except among a few truckers. Time marches on.